For Dance Classes you may register for Session 1 (September-December, Session 2 (January-May) or BOTH! Each spring members registered for the winter/spring dance session are invited to participate in the Annual Hayden Spring Dance Recital. The recital is a wonderful opportunity for dancers to display the skills they have learned in class and to learn about the art of performance. Performing builds character, self-esteem, and is lots of fun! This is a parent/child class that allows you and your little one to work on basic motor skills together. Movements include jumping, galloping, twirling, balancing, pointing and more. Children will also get to play fun games with scarves, wands and instruments. Check back for another session soon! Does your child want to take both gymnastics and dance but you can’t decide or don’t have the time? If so this is the class for them! Start in the gymnastics room where they will begin with a quick warm-up, followed by fun obstacle courses that will work their flexibility, strength, and coordination. Each week there will be a skill of the week that can be used in gymnastics and dance/acro. When done in the gymnastics room the teachers will bring them to the dance room where they will work basic ballet skills and creative movement with Miss Sam for the second half of class. Great for kindergarten and younger elementary age dancers. In this class they will get an introduction to tap along with either ballet or jazz. They will learn how to make basic sounds and perform simple steps and movements. It’s divided into 30 minutes of basic tap and 30 minutes of basic ballet or jazz depending on the combo class you sign up for. They will also learn some terminology and be introduced to counting music. For our slightly older elementary age dancers who like a variety of dance styles. In this class dancers will be introduced to lyrical for the first time. Class is divided into 30 minutes of Jazz, 30 minutes of Tap and, 30 minutes of Lyrical. They will review basic steps for each style and will also be introduced to some intermediate steps as well. For our high school students. They will work on more advanced and faster tap steps. It’s a 45 minutes class that begins with a warm up then moves into across the floor combinations and dance combinations in center. 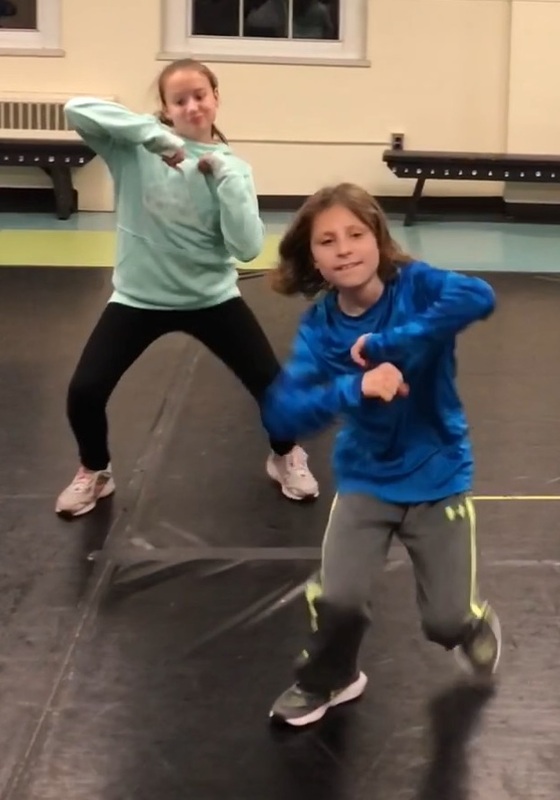 In this class middle school age students will learn intermediate tap steps and work on making sounds crisp and clear. They will also be introduced to some advanced steps as well. It’s a full hour class starting with a warm up and then moving into practicing steps across the floor and various dance combinations in center. For middle school age dancers. This class focuses on intermediate dance steps and an introduction to some advanced ones as well. Class is divided into 45 minutes of Jazz and 45 minutes of Lyrical. Each class begins with a stretch and then goes to across the floor combinations and center combinations. A style of dance that combines gymnastic movements and dance. In this class students will begin with learning basic acrobatic movements- forward rolls, backwards rolls, handstands, bridges, leaps, turns, jumps etc. After students have mastered the basics they will move onto more advanced tricks- back walkovers, front walkovers, back handsprings, switch leaps, calypsos, aerials. Safety is extremely important in these classes so each class begins with ample stretching and warm up exercises. Students do not advance to harder tricks until they have mastered the basic ones. In this class dancers will learn basic hip hop movements up through advanced movements as they get older. Basic movements consist of isolations, bouncing, heel digs, uprocks, jumps & ponies. Advanced movements include gliding, baby freezes, popping & locking, helicopters & popular dance moves. Dance team is for the more serious and advanced dancers who would like to challenge themselves and have the opportunity to compete at local dance competitions in the spring, they also take part in the annual spring dance recital. We currently have three dance teams Senior HipHop Team, Junior HipHop Team and Acro Team. Team members are chosen at our annual fall try-outs in September and are open to dancers grades K & up. Teams are not selected based on age but rather by what level a dancer is at and what individuals we feel would work well together to make a great team. Each team learns 1 dance routine to compete at competition. They work on their routine year-round all while perfecting their dance steps, skills and tricks. Dancers practice two hours per week. It takes hard-work and dedication to be a part of team but at the same time it's also very gratifying and lots of fun! Try outs for our dance teams take place in September.